Witness how InstantChange™ helps you deliver more with less, keeping in step with dynamic business needs. Use an intuitive drag and drop interface to establish the business logic of a workflow, define its steps, assign people and tasks, and complete it with actions that it triggers. There’s no coding involved. Getting started, you don’t need established scenario and contingency plan. WEBCON BPS InstantChange™ technology allows you to design your workflow as you go. This offers you quick turnaround time to modify it when receiving feedback from end users. Delivering incredible time to business while ticking all their wish list items as well, might as well make you an IT superhero. WEBCON BPS is the modern foundation for a truly agile, iterative application delivery model supported by a cutting-edge DevOps approach. Create dynamic forms for SharePoint, mobile devices and Outlook without coding. Set default values and custom validations. Reuse data from your ERP and other external systems. Gather files, emails and reports in one place, creating a one-stop shop for your end users. Help them complete their tasks with confidence and efficiency. Visible or hidden, editable or read-only, required or not? 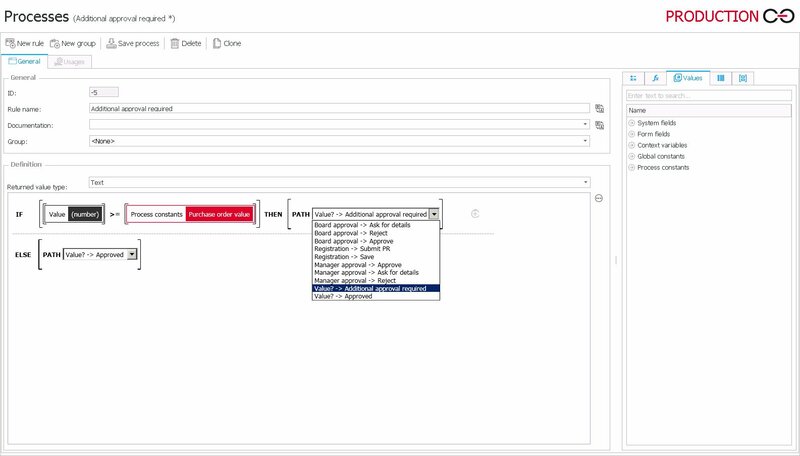 With InstantChange™ technology, users can request changes to fields, forms, layouts and more while you simply tick a check box and it’s done. WEBCON BPS enforces standardization, which makes every application your team builds behave and look the same. Outstanding user adoption becomes the norm, and you gain full control over the application portfolio in your company. Define the behavior and logic of your applications without coding. Conditional behavior of forms and fields, the logic of the workflow and the calculations behind it can all be defined through an intuitive drag and drop system. Why not use code? Not only can you build your application faster, but you also get clarity of design and unparalleled standardization that streamlines maintenance and further change management. Whenever you feel your team needs a new superhero on the team, a shallow-learning curve gets him going in less than two weeks. Avoiding coding is great, but what happens if you actually need to get in there and code? When things get really complex, WEBCON BPS allows T-SQL queries to get precise. If you still need more, you can use .NET SDK to cross any boundaries on the horizon. Everything is possible with WEBCON BPS. Applications our clients create with WEBCON BPS handle end-to-end business processes, spanning across organizations and leveraging data from the business systems used. Whether connecting to ERP, CRM, or operations and data warehouses, you’ll get there using integrations with web services and direct database connectivity. 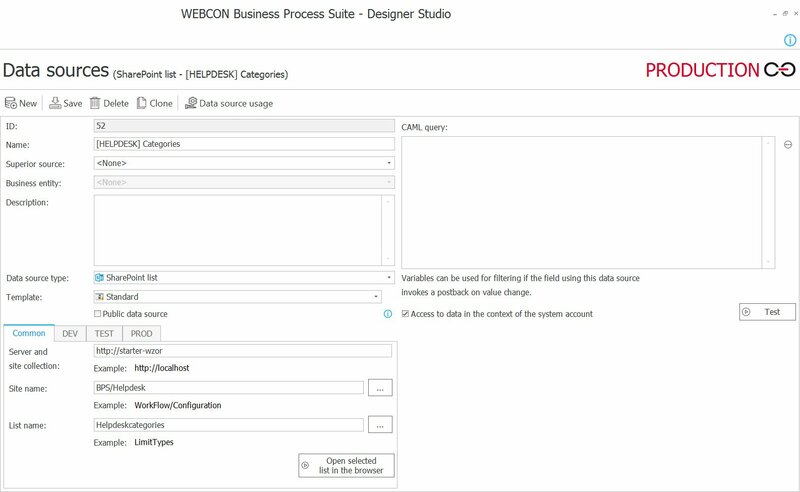 WEBCON BPS allows you to create data models and then use them in the applications you build. You don’t need to write any code, regardless of if you decide to use web services or direct database connectivity. WEBCON BPS streamlines the progress of your application from Dev to Test to Prod, by automatically redirecting data models to the proper environments of the systems you connect to. Large, multi-entity organizations with broad IT systems portfolios are also supported, as WEBCON BPS data models smartly redirect to company-specific data sources. InstantChange™ technology doesn’t just support change management, it impacts the entire process of delivering business applications. of innovation that support business processes in today’s Industry 4.0. Instead of slogging through waterfall-based approach, your team can deliver any critical business application in hours using an iterative approach. Sit down with operations leaders and compose the perfect solution right in front of them, exactly as they want it. You’re left to focus on the desired business result, as the outstanding ease of change offered by WEBCON BPS allows you to modify applications on the fly. When your business department representatives can understand the delivery process, they get more intimately involved in creating business applications with IT. Our clients testify that WEBCON BPS was the catalyst that sparked their transformation into modern DevOps entities.